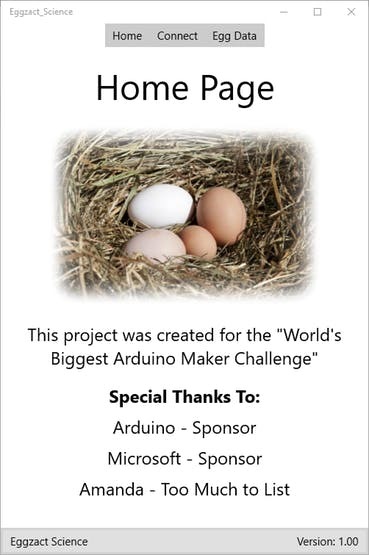 Entry for the “World’s Largest Arduino Maker Challenge” – An IoT Project with Windows10, the Arduino MKR1000, and Chickens. This project applies directly to the modern chicken farmer, but also to those interested in remote sensing using a windows apps and Arduino. Follow this process to update your chicken coop and bring it into the modern age. The idea behind this project is that the eggs being laid are counted and recorded on an app for you. 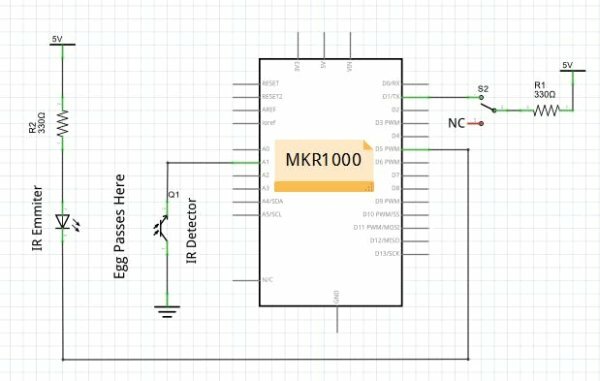 The eggs pass through a sensor which is recorded on a MKR1000. This data is then hosted on the MKR1000 as a local web server that is available for the Universal Windows Platform App to grab and use. Building the Coop: I made this prototype to have a slant of 15 degrees based off online research that said chickens won’t mind a sloped nesting box up to a 15 degrees. My prototype is made out of wood, and attached with hot glue and screws. I built rails to guide the egg down the shoot into the collector bin. I used extra gripping shelf liner to add a speed bump right below the sensor to help slow the egg down to insure the egg trips the sensor. See the schematic below. Note: I used an Arduino Uno as board in the schematic so the descriptions on the pins don’t all match up with the MKR1000. Setting up the Sensor: I set up a generic infrared, IR, emitter and an IR detector across from each other and aimed directly at each other. The IR emitter sends a “beam” of IR light to the detector. The detector is able to sense when the egg passes and blocks the IR emitter as it rolls into the collector bin. This sensor is hooked up to an LED that signifies that they are on and working and there is a button to reset the memory of how many eggs have passed. All software created for this project is available on GitHub using the link at the end of this article. Universal Windows Platform (UWP) App: Provides and organizes the data collected from the Arduino and displays it for the user. Visual Studio (VS) and UWP apps are pretty complicated if you don’t have previous exposure to them. I am by no means an expert and took many many hours to create this app. I did comment the code in hopes to make it understandable. 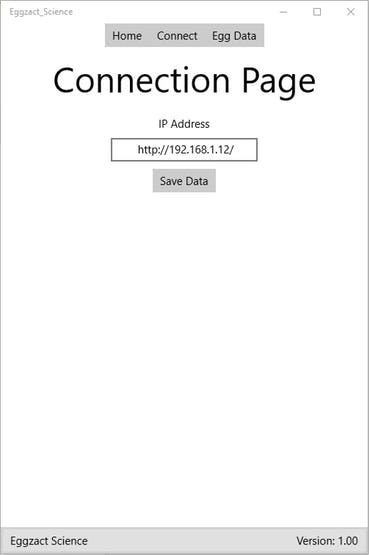 See the video below for a brief walkthrough of both the code and the app. 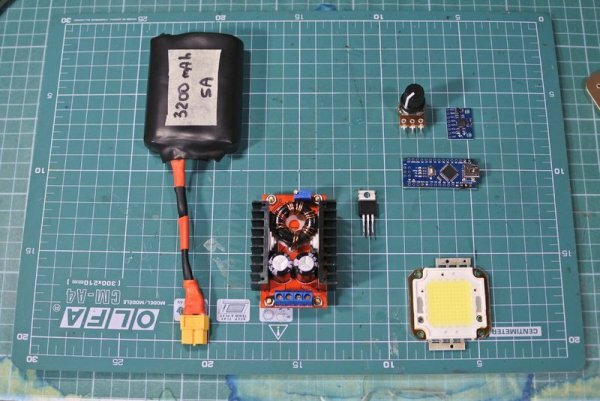 Arduino: The code that runs on the Arduino MKR1000 is responsible for three tasks. The first task is to check and record if any eggs have gone past the IR sensor. 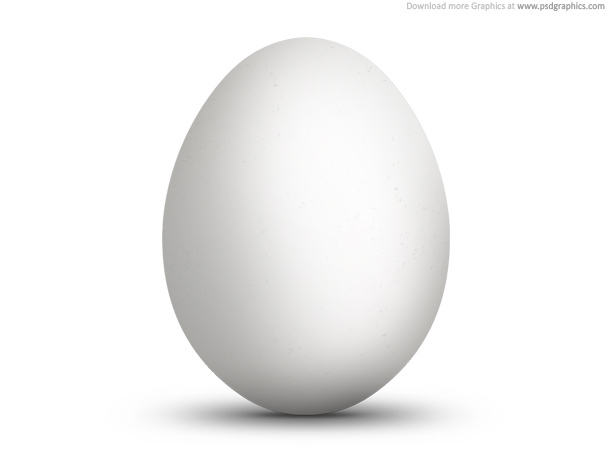 The second task is to check the button by the coop that resets the egg count, for use when the user picks up the eggs. 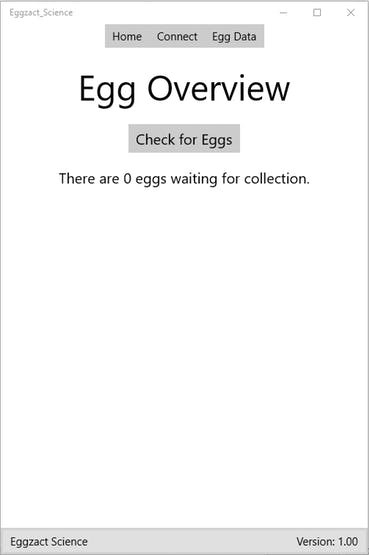 The final task is to act as a web server that hosts the egg count for any client request from the windows app created for this project. See the video below for a brief walkthrough. *  as a web server, to publish the number of eggs. intermitantly when button is pushed or wires bumped. // could miss an egg. // This function just reads the IR detector value. // be added to the count. // If IR now is < .4 Volts count as egg and wasn't already counted. // 110 is approximately the Analog to Digital converter changes 0.4 Volts to. // First send the data to serial montoring for debugging purposes. // thought to be a wiring or connection issue.